King’s Partnerships was delighted to collaborate with the The Beaney Museum to bring Alom Shaha to Canterbury to run a science workshop for families. Alom is a secondary science teacher as well as an author and his book, Mr Shaha’s Recipes for Wonder, is packed full of ideas to show parents how to be their child’s first science teacher. He began with some exciting demonstrations, including orange-peel sparklers and levitating candles, encouraging the children to ask questions behind the science. 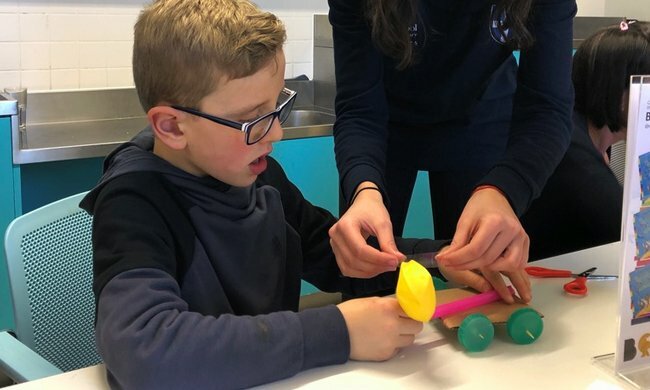 The families then had a go at making balloon-powered cars, mini-helicopters and paper bangers, all assisted by volunteer students from The King’s School. Head of Partnerships, Christina Astin, said she looked forward to many more collaborations between The King’s School and The Beaney Museum.